Our next event is next Saturday 16 February at Diamond Creek Reserve – 6pm start. Please note that this is a changed start location from previously advertised. Enter from Main Hurstbridge Road and the assembly area is behind the Bowls club. 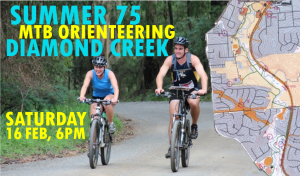 Organised by the Yarra Valley Orienteering club, this event is a bit different from the first 2 events in that it will not be held in a mountain bike park but instead the map includes parkland and bike trails along the Diamond Creek from Eltham North to Diamond Creek itself. It also includes some suburban streets and reserves but stays away from busy roads. It will be easier riding technically, although there are some hills away from the creek to add a bit of physical challenge for the stronger riders. Course setter Alex Randall has positioned 20 controls on the map with riders making their own choices as to which controls to visit and in which order. Starting any time from 6.00pm to 6.15pm, riders must be back before their 75 minutes elapses to not incur penalties. We will have extra supplies of the SI timing sticks, after we ran out at Lysterfield, so we won’t have that problem here. Again, enter on the day from 5pm. Arrive early if you need to grab one of our loan mapboards. We only have a limited number of these, so feel free to bring along an emergency clipboard to cable tie to your bars in case you miss out. The BBQ food and drinks will again be available. We’ll also bring more supplies of cold drinks to avoid running out of those. Again a reminder of the changed start location – see above. Hope to see you there!